When was the last time you indulged in a curry dish? 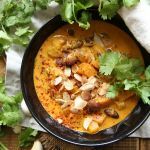 Whether you enjoy it on a weekly basis, rarely or never, this is a vegan pumpkin curry recipe you need in your life! It’s colorful, light, full of flavor, and could be on your dining table in under 30 minutes! 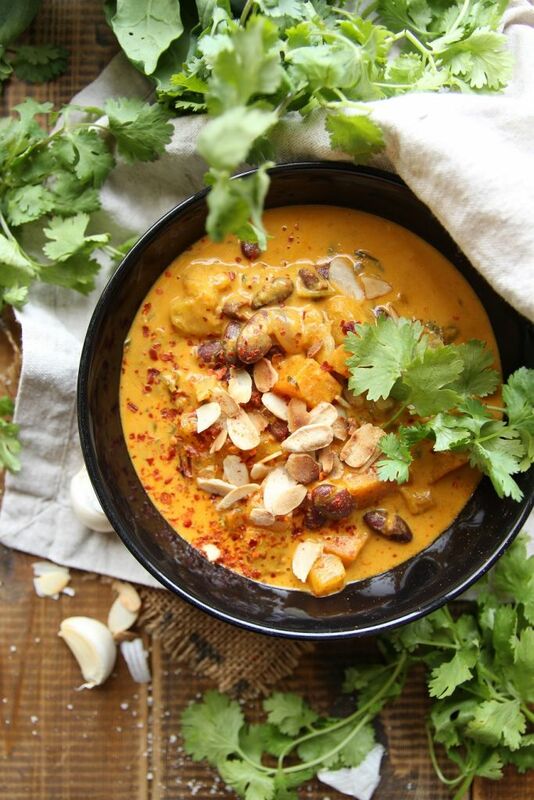 This vegan pumpkin curry is hassle-free, ridiculously easy and quick to make, healthy, filling, delicious, and loved by my entire family. Garnished with toasted almond flakes, and served with plain rice, you can either enjoy it as a saucy curry like I do or if you prefer, reduce it to a drier curry, it’s up to you. Not a huge fan of spicy food? Neither am I and neither is this pumpkin curry. However, if you simply can’t get enough spices in your life then go ahead and adjust the seasoning according to taste. There’s really nothing else to say, other than dice those veggies, throw them into a pot, add coconut milk, curry, flavoring, etc… Then cook until the veggies are nice and soft, and dig in! Peel and dice the pumpkin and sweet potato and set aside. Peel and slice the red onion in half, then slice into long thin strips. Heat a pot over medium heat, add the olive oil and sliced red onion. Cook until onion starts to sweat. Next, crush the garlic cloves and add to pot. 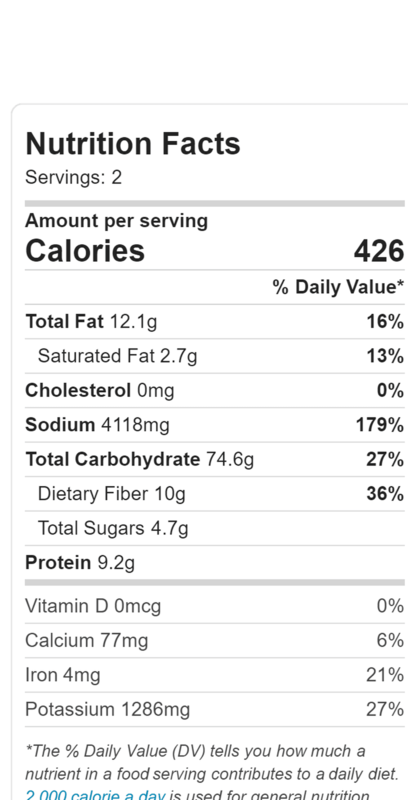 Add the diced pumpkin and sweet potato to the pot and let cook for a few minutes, then also add the cooked kidney beans. 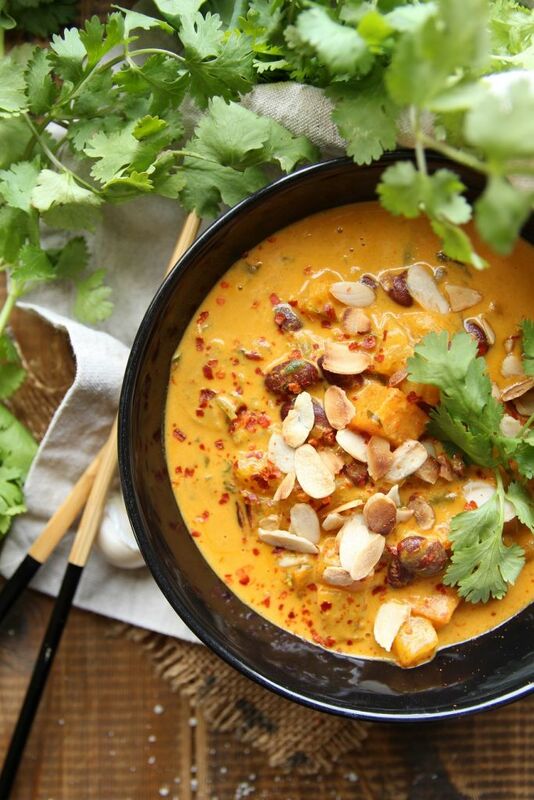 Whisk together the coconut milk, water, turmeric and red curry paste, then add to the pot. Roughly chop the coriander, then add to the pot and season with sea salt to taste. Cook until pumpkin and sweet potatoes are ready. If you like a saucy curry, remove from heat, add roughly chopped spinach, let it shrink and serve. If you prefer a drier curry sauce, continue to cook until curry has reduced according to your liking, and then add the fresh spinach leaves. Garnish with dried chili flakes and toasted almond flakes, serve with plain rice, and enjoy! This vegan pumpkin curry is ridiculously easy to make, healthy, filling, delicious, and could be on your dining table in under 30 minutes! Peel and slice the red onion in half, then slice into thin long strips. Heat a pot over medium heat, add the olive oil and sliced red onion. Cook until onion starts to sweat. Next, crush the garlic cloves and add to pot. Add the diced pumpkin and sweet potato to the pot and let cook for a few minutes, then also add the cooked kidney beans. Whisk together the coconut milk, water, turmeric and red curry paste, then add to the pot. Roughly chop the coriander, then add to the pot and season with sea salt to taste. Cook until pumpkin and sweet potatoes are ready. If you like a saucy curry, remove from heat, add roughly chopped spinach, and serve. If you prefer a drier curry sauce, continue to cook until curry has reduced according to your liking. 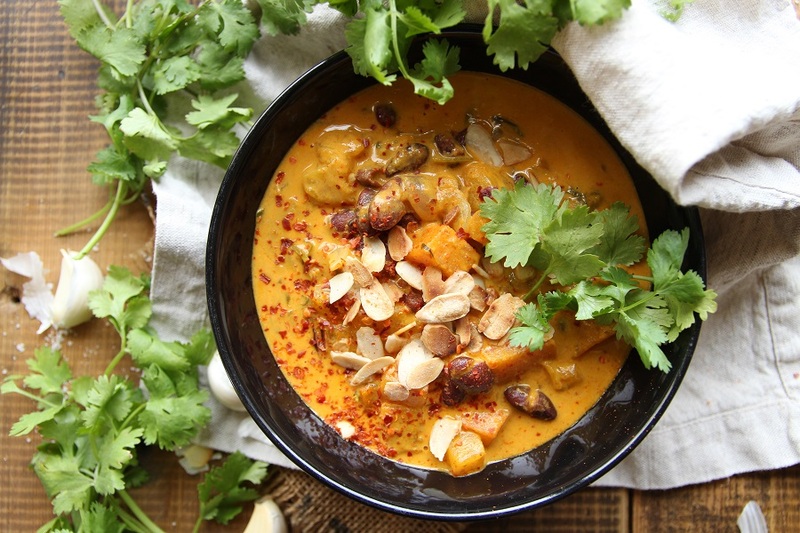 Pin This Easy Vegan Pumpkin Curry For Later! 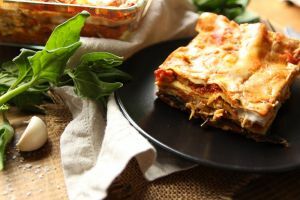 Next time try my Vegan Lasagna! It’s made up of nothing but plant-based goodness! ← Healthy Vegan No Bake Energy Balls!